The Southeast has seen its fair share of natural disasters and flooding in the last several years, including two hurricanes in Florida last year – the first hurricanes to hit the state in more than a decade. But none of these events have come close to reaching the potential impact a serious storm surge event could have on the region. According to CoreLogic’s 2017 Storm Surge Report, which examines risk from hurricane-driven storm surge for homes along the Atlantic and Gulf coastlines across 19 states and the District of Columbia, as well as 86 metro areas, the total reconstruction cost value (RCV) in the event of a hurricane storm surge inundation in these regions would be more $1.5 trillion. The total number of homes that could be affected along the Gulf and Atlantic coasts, defined by CoreLogic as the 3,700 miles of coastline extending from Maine to Texas, is nearly 6.9 million. In the Gulf Coast region – running from Texas through the tip of South Florida – almost 3 million homes are at risk with a total RCV of $593 billion. The Atlantic Coast accounts for 3.9 million homes and a RCV of more than $970 billion. To estimate the value of property exposure of single-family residences, CoreLogic uses its reconstruction cost valuation (RCV) methodology which estimates the cost to rebuild the home in the event of a total loss. The reconstruction cost estimates more accurately reflect the actual cost of damage or destruction of residential buildings that would occur from hurricane-driven storm surge since they include the cost of materials, equipment and labor needed to rebuild and also factor in geographical pricing differences. Actual land values are not included in the estimates. The values in this report are based on 100 percent, or total, destruction of the residential structure. The Southeast coastal states CoreLogic examined in its report of Alabama, Florida, Georgia, Mississippi, South Carolina and North Carolina, account for at least 3.6 million of the 6.9 million homes at risk along the Gulf and Atlantic Coast. 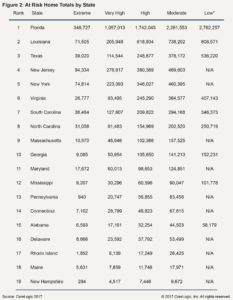 Unsurprisingly, the majority of those homes – about 2.7 million – are in Florida, which carries a whopping $536 billion reconstruction cost value, the highest of any of the 19 states. 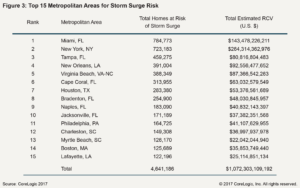 The Southeast also accounts for nine of CoreLogic’s top 15 metropolitan areas at greatest risk of storm surge, with six of those being Florida cities. It’s common knowledge that Florida is at risk of hurricanes, but the state has gone many years without experiencing significant damage from a major storm. Dr. Tom Jeffery, senior hazard scientist at CoreLogic, said that can often lead to “hurricane amnesia,” among citizens and municipalities and that can impact whether they are adequately prepared for when a big storm event does occur. He added that many people in these communities don’t realize what their storm surge risk is, outside of the 100-year flood plain.